Starting at the Upper Works parking lot it starts out easy as pie on a flat road and for the next 1.6 miles has some easy climbs and descents with easy-moderate footing. Don’t miss the large meadow just before the Calamity Brook bridge crosing at 1.6. The trail then gets rougher, where you get your first taste of mud, and the what feels like never ending rocks and boulders. No biggie in daylight – but in the dark with my headlamp this felt never ending on the way out. Not to mention, my feet were screaming at me. Continue to follow the brook with easy to moderate climbs climbs. I’d recommend taking the high water suspension bridge at 2.9 – even in low water. Seriously, they are all kinds of awesome. The climbs is now moderate – nothing to hard but not exactly flat. At 4.1 miles there’s a series of log bridges – many thanks to the volunteers – you gave me a reprieve from the never ending mud. Just after the open marsh and the north end of Calamity Pond at 4.3, there is a side trail leads to Henderson Monument (which I always find cool but a bit out of place in the ADKs). Turnning R, the trails climbs gradually along a “favorite of mine” – a very rocky section to the junction at Flowed Lands at 4.7 miles. A perfect spot for a respite and snack. Turning R to take the ladder and cross the dam, bear right after the bridge you’ll soon reach a suspension bridge over the Opalescent. Have I mentioned how much I love suspension bridges?! When you reach the other side, turn left, and continue up the left bank with easy grades, passing a water fall at 6. 1 and ascend a ladder at 6.4, with some ledges for great views of an amazing flume. No really, take some time and enjoy it. Though I may have enjoyed too much and gobbled up valuable daylight. Crossing a small tributary, climbing away from the river (easy – moderate) to the junction of the abandoned Twin Brook Trail at 7.4. Bear left and gently descending – you’ll see UpHill Lean-to and just beyond is the herd path to Mt. Redfield and Cliff on your right. And now the “real fun” begins. Don’t get me wrong, at this point you’ve hiked in, had rocking footing, crossed numerous stream, bridges, and been “introducted” to mud. But that’s all the walking in part of the day – now you’re about to hike and enjoy the climb. I decided to tackle Cliff first. And oh boy was that the right call. Cliff turned out to be far easier than Redfield, and I may have not taken Cliff given the time, if I’d done Redfield first. The start of Cliff is the muddiest section you’ll enjoy all day. And by enjoy, I mean 300+ yards of various mud trail, mud ponds, with various levels of consistency. I can now grade and describe different types of mud – much like Vermonters grade maple syrup. I don’t think my gaiters or boots will ever smell the same. And beware. You think the fallen floating logs are safe for crossing. Oh they are and a huge help – but they are slippery, and I had one wipe out that was straight out of a sitcom. Yes, mud was everywhere, even down my shirt and in my ears. 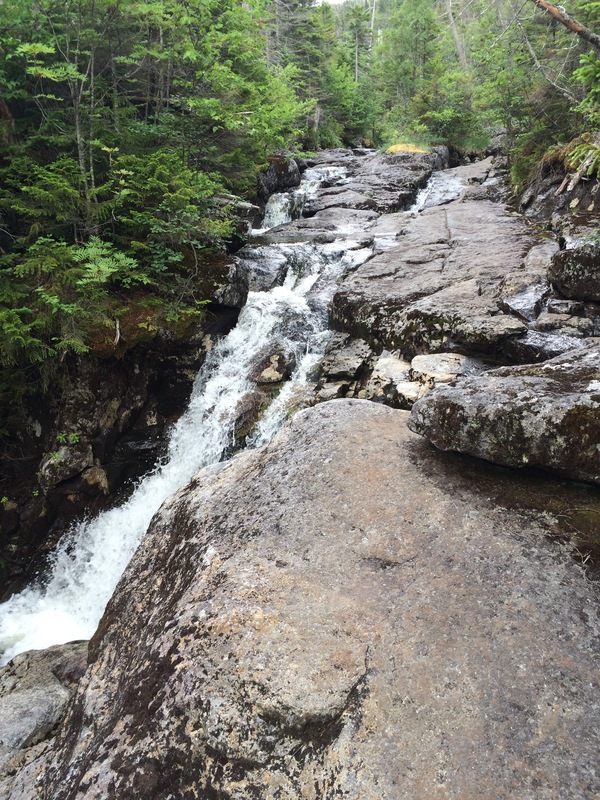 I decided to ditch my pack – it’s only a mile, right? Figured the lightened load would be worth it. Carrying my reserve .5 L of water, trailmap and hiking pole. It was still the right call and made the mile easier. But carrying the water turned to be a bit awkward up those cliffs. All in all – they weren’t too bad. 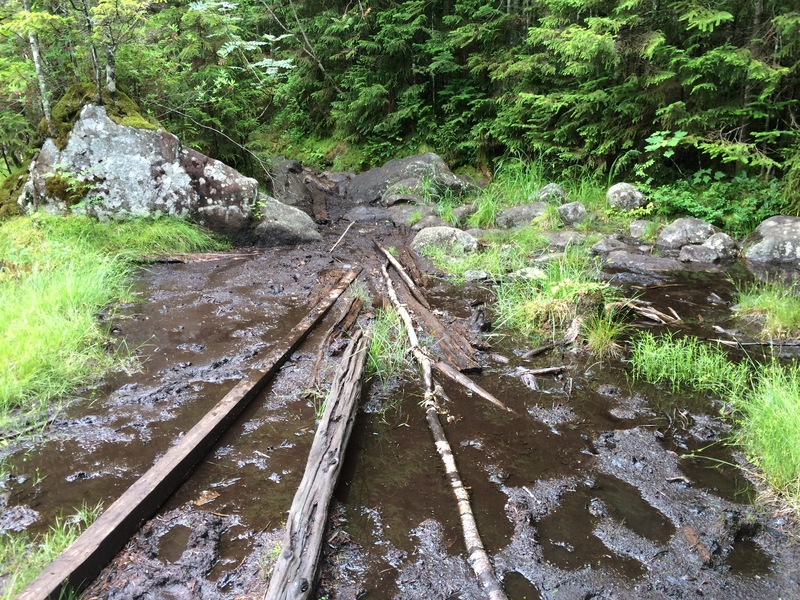 Steep and winding – more like a steep never ending scramble, with slip and slide mud. I still think Saddleback Cliffs are more comparable to cliffs. There are a few options to cut around them – I chose to take them head on. Just beware of the slippery condition of your shoes from all the mud. I had one small slip, with a foot hold wet from recent rain, plus some mud, and the sorry muddy state of my shoes, it just didn’t hold and I slid down. It was early, and only about 5 feet, but my left knee, will have a nice bruise and scrape for a bit. 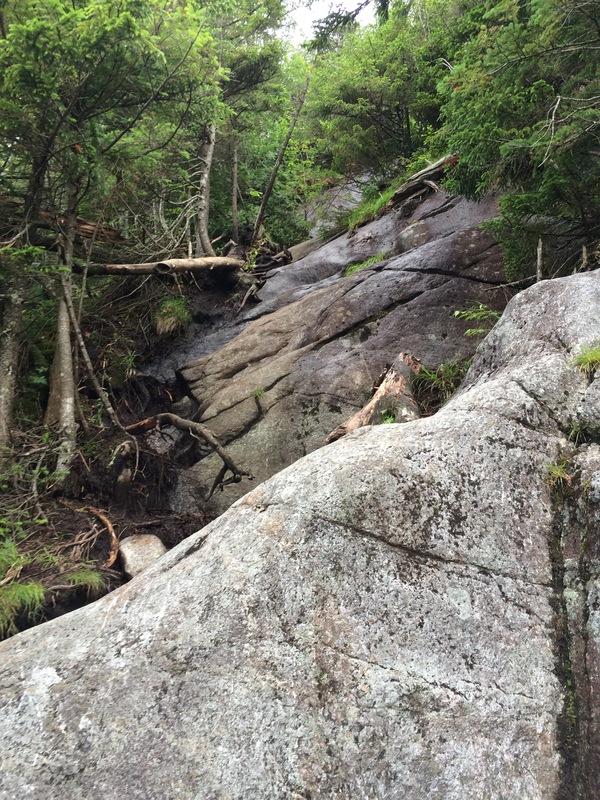 But that was the worst of it – and come to think of it the worst “fall” I’ve had in the ADKs to date. My feet. That’s a different matter. Essentially there are three cliffs. The last being the steepest and longest. A few different options on going up. I chose to stick to the edge and use an occasional tree root for “help”. But I saw several folks using the semi-bushwacks to work around the bulk of the third. Here’s where you’ll see probably your clearest view for the day. Enjoy. You’ll soon reach the false NE summit, follow a ridge, descend – I wanted to yell at Cliff at this moment. Nothing can describe how much I hate giving up elevation gain and false summits are not my fav. But what feels like a huge elevation loss, really wasn’t that bad. Once reaching the col, it’ll rise steeply shortly, and you’re there. Woohoo! In all its’ about. 5 miles from the false summit to the true summit. And Cliff from the junction is about 1 miles. GPS reports from fellow hikers ranged from .8 – 1.2 so I’m splitting the difference. It took me about an hour up and the same back down. I should of done it 45min but mud + fatigue + awkward water carrying I was not at my finest. In hindsight, I would of pushed harder if I knew how “behind” I was with the effort and time Redfield would require. I had no view. Zero. Supposedly there is something there, but the clouds moved in and I saw trees and a sign and that’s it. After my hike back down – which considering the cliffs was pretty smooth. I thank yoga every time I tackle scrambles, since my small stature, stretching for footholds are my new bff. After about.3 miles you stay high on the bank of the brook, but upon returning (at a nice waterfall) the path follows the brook and and many points is in the bedrock. When on trail in the woods – it is rough, as is expected on a herd-less path, but the bedrock was just slow for me. Not overly physically challenging, but slow footing-wise. After another .3 miles a tributary comes in, which again is heavily in the bedrock but gets steeper and going in and out of the woods. 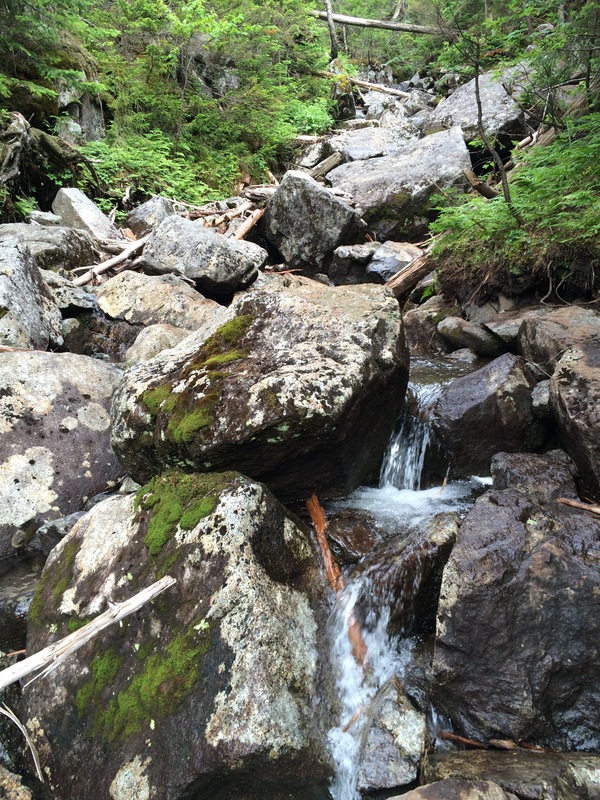 Past the tributary, you’re now in mix of boulders and woods with what feels like some serious elevation gain. I was beat, it was taking longer. At one point when I thought I was close, a couple hiking down said they’d been descending for 40 minutes. Yup. I wasn’t close. But you’ll eventually reach it. But on the upside every single person I ran to, at the summit and going down, had the same look of “will this trail ever end”. So at least it wasn’t just me. The summit has some nice views if you peek over the treeline. It is by no means an open summit or expansive views but there is a peek. Bugs will tear you up. The beauty of Redfield was the river and flumes, especially when the sun would light up a waterfall and cascades just so. But I was so exhausted and my kees were not looking forward to the climb back down to the main trail. I slugged down. The bedrock and boulders just are not my strong suit for speed. The early evening sun was just beautiful shimmering on the river, waterfalls and flumes. If I had the time I would of soaked it in and wish I had taken some pics. One first I did have was running into a woman, who was also finished her 44th peak on Redfield, who recognized me from writing this blog. Who knew, people other than my direct family actually read it. Warms my heart. 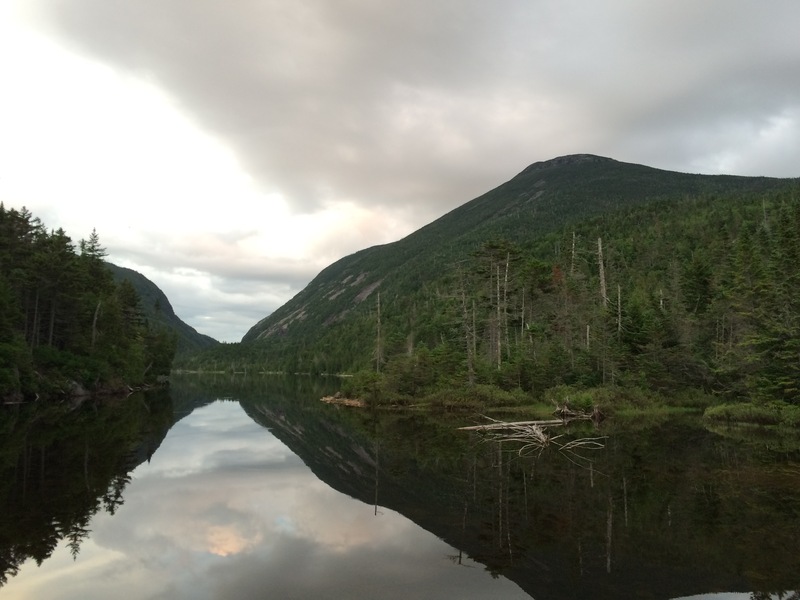 I was sure jealous of their camping near Lake Colden Dam when I still had another 5.6 miles to go. On the up swing I really wanted to make it past Flowed Lands before night hit, which I did and then some. My the last 4 miles were slow going. Not too of a challenging hike coming in, and while mostly flat or descending, the rocky and muddy footing made it slow. But the key was it was safe. No scrambles or anything I would be cautions of in the dark. Plus the trail is very well defnined in that area. At 11pm, 14 hours after starting, I was beyond joyous to see the parking lot. Or at least I would of been if I had the energy. After a quick cloths change, ice-filled water and coffee I was ready to hit the road. The mud and water logged shoes took its toll on my feet. Upon taking my shoes and socks off my feet were itching like crazy. And there was a “filmy goo” all over. Upon closer inspection, that was my skin. Yep, after sooooo much mud and wet soaked feet, on parts of my ankles and feet, a few layers of my skin was just brushing off. It was pretty gross. And I thank cruise control for the drive home so I could obsessively scratch, but at least I didn’t lose a toe nail. It’s really the small things that matter. All and all, another two peaks down, and two that I worked for. I’m sure earlier in my ADK 46 the cliffs on Cliff would of been more daunting. If there is anything I’ve learned is that it is all relative. If I read back to my earlier hikes on spots that seemed “hard” I’m sure I’d laugh now. And other hikers would find my challenging parts or slow pace amiss. 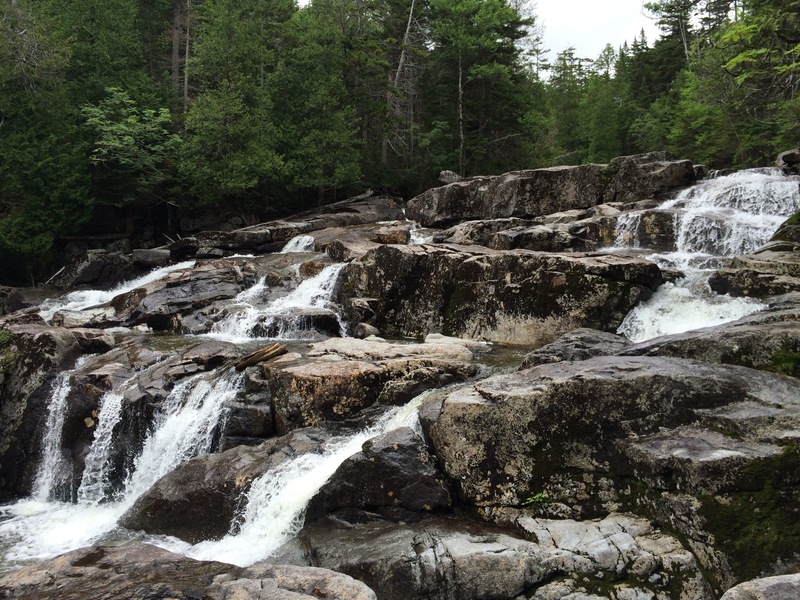 I doubt Cliff or Redfield will be pulling me back to their summits soon – there are so many that I earn to revisit – but if nothing else I will be prepared for the mud and more time to enjoy Redfield’s numerous waterfalls, cascades and flumes. 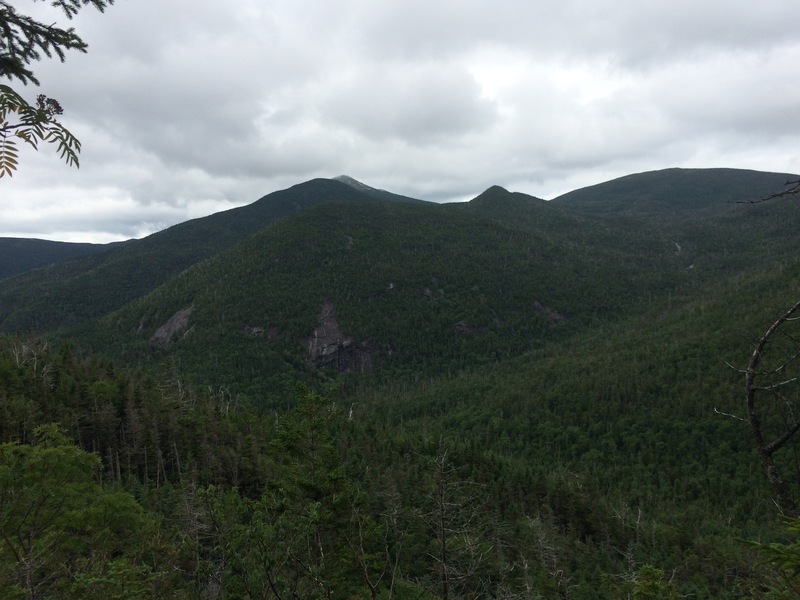 This entry was posted in Uncategorized and tagged Adirondack High Peaks, Adirondack Mountains, ADK46, Calamity Brook, Cliff, Cliffs, Flowed Lands, flumes, Henderson Monument, Herbert Creek, herd path, Hiking, Lake Colden, Lake Colden Dam, Marshall, Mud, New York, Opalescent, Redfield, Saddleback Cliff, Summit, Trail, trail-less, Twin Brook Trail, Upper Works. Bookmark the permalink.